Good morning! How's everyone doing today? We have had a crazy week with my boys finishing the school year and then tornado fear and warnings on Tuesday night and Wednesday. It was pretty stressful and scary to watch the weather guy talk about the tornado heading towards my husband's work the other day. Communication was also difficult then as I guess a ton of people in our area were texting and using cell phones all at the same time. I'm so glad it ended up passing him by and not causing a lot of damage in our area. 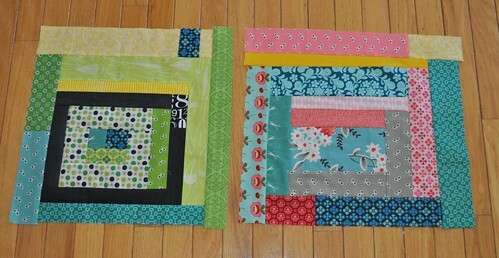 I'm finding that it's easier to work on 3 or 4 blocks at a time than it is to work on just 2. That way I can set up to sew the next piece on a few blocks at a time instead of just one, and each time I go to the ironing board I'm pressing more than one as well. I bought a fat quarter of gray Moda crossweave to see how I liked it, and it is going to be the sashing and border for this quilt! (You can see it in the top left block in the photo immediately above.) I ordered more yesterday and can't wait for it to arrive. I'm planning on another big sewing session today--going to spend some time cleaning the kitchen up first! I love what you're putting together. It's really bizarre to me that I have a hard time putting lots of prints together, but I ALWAYS love it when other people do it! I just finished two front of wonky log cabin and so I've got a sweet spot in my heart for your squares. They are coming together very nicely! Isn't it amazing that something that (in theory) is free-style - no fussing with math or precision cutting - can still take so long? Glad you and family were able to stay out of harms way. Not everyone was so blessed. Love those blocks! Love the blocks you made! Your quilt is going to be very pretty! 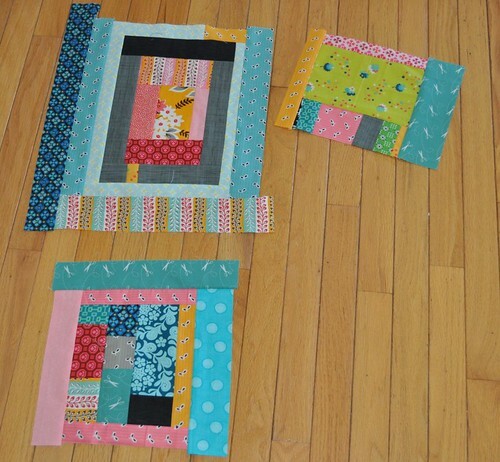 the gray crossweave will look fab with these blocks!